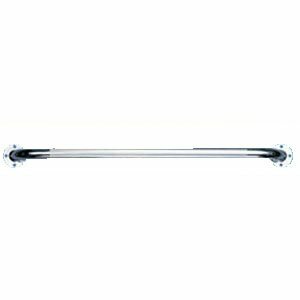 B21300 Size: 32" Features: -Wall grab bar. -Textured diamond knurled gripping area. -Professional installation is required. -Weight capacity: 250 lbs. -Space required is 15.5" to 2.5". Finish: -Chrome. Material: -Metal. Dimensions: Size 12" - Overall Length - Side to Side: -12". Size 12" - Overall Product Weight: -1.2 lbs. Size 14" - Overall Length - Side to Side: -16". Size 18" - Overall Length - Side to Side: -18". Size 24" - Overall Height - Top to Bottom: -1.5". Size 24" - Overall Length - Side to Side: -24". Size 32" - Overall Product Weight: -1.8 lbs.